We have already heard about the remote controlled moths being developed by implanting control chips into moth larvae. On a sort of parallel course, we have now learned that Harvard University has designed and built a fully robotic fly. And it does fly. Of course DARPA is funding this research, in hopes of using the robotic Musca domesticas for stealth surveillance operations. Recreating a fly's efficient movements in a robot roughly the size of the real insect was difficult, however, because existing manufacturing processes couldn't be used to make the sturdy, lightweight parts required. 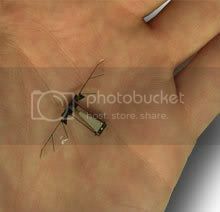 The motors, bearings, and joints typically used for large-scale robots wouldn't work for something the size of a fly. "Simply scaling down existing macro-scale techniques will not come close to the performance that we need," Wood says. While these developments are a major achievement, there remains quite a bit more to be done before this fly will be turned loose. It needs an onboard power supply, tiny sensor equipment and flight control computer chips. But having taken wing, one can have little doubt that this little robot will eventually be on the job. Now all we need is a robotic fly swatter!